Tahitian cultured pearls offer a dramatic touch. 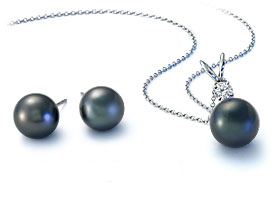 The natural black colour of these pearls comes from the colour of the oyster's black lips. These pearls are traditionally called "black," but their colour can range from a metallic silver, to the colour of graphite. And within this range of colours they can have bluish, purplish, or greenish overtones . Tahitian cultured pearls are cultivated from the black-lipped variety of the Pinctada margaritifera cumingi oyster, which are usually 6- to 12-inches in diameter and produce large pearls. This oyster is very sensitive to the pearl culturing process, which makes the pearls very costly to produce. A gift of Tahitian cultured pearls makes an extraordinary, unique gift. Our beautiful Tahitian cultured pearls are available as stud earrings, fashion earrings, strands, pendants, and bracelets.